Come to the party - and maybe you'll get more than you bargained for! Publisher's blurb: "Masquerade balls are a feature of civilised urban life, and eventually the PCs may be invited to attend such a prestigious event. Perhaps they are invited to secretly meet a new patron or to stymie some plot of these attending the event or alternatively their adventure may start unexpectedly during such an event. Masquerade balls are excellent excuses for role-playing and offer an excellent change of pace to a typical adventure. "However, designing all the guests and their costumes would take more time than even the most diligent GM has at his disposal. That's where Campaign Events: Masquerade Ball comes in. 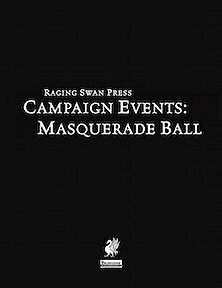 Presenting copious notes on masks, costumes and guests along with hooks, opportunities and complications it takes the hassle out of running a masquerade ball and lets the GM concentrate on the important details of the campaign!"